Ramanthapur, Sep 30: Hello friends! We are Matteo Zoico and Matteo Cegalin from Italy. We are doing our college studies and we are friends since our childhood. Our curiosity for the different cultures and our love for travelling have brought us to undertake this experience. Before coming to India we had some vague idea about India through one of the Italian priest who worked India for a while use to share his experiences in India different works carried out by catholic priests and religious. After this conversation with him we decided to come to India and one of the Indian priest by name Fr Hrudyaraju who is a student guided them to make plan to visit some of the services offered to the most-needy people of the society. That made us reach Don Bosco Navajeevan, Hyderabad. About our experience at DBNJ we can truly say that was wonderful. At first our welcome itself was unexpected, unforgettable and unimaginable. Just as we arrived the boys of Don Bosco Navajeevan, Ramanthapur, overwhelmed us like a river in flood making us fell part of them. Due to our short stay we couldn't create a long term plan and we were helping other volunteers who are staying for one year volunteership to take classes. We follow the boys during their daily routine time table, we helped them in their homework, and we also helped during training in the trades. What we had found in Navajeevan was not a house or a hostel but a home. Here at DBNJ the street children have the possibility to find again the smile and happiness which they lost during their stay on the streets. This is possible due to hope given to them for a better future. They also found a new family where they can feel at home and begin new life. At the end of the two weeks we can say that we established a true friendship with the boys. A special thanks to the director Fr. 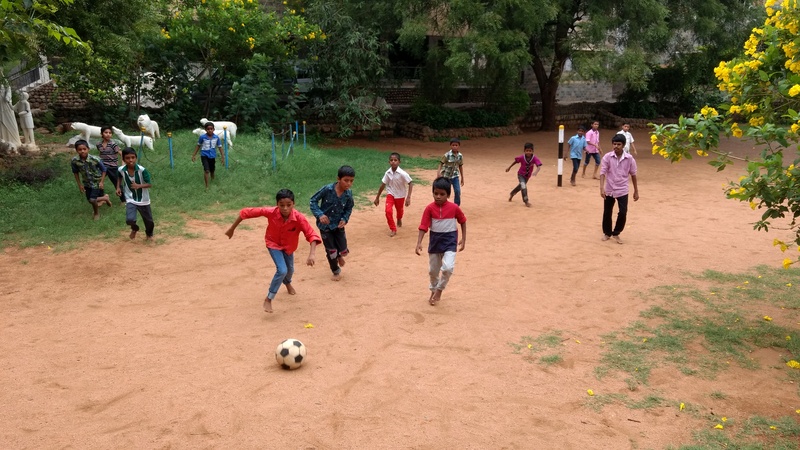 Sudhakar and to the other fathers, to the staff, to the volunteers and to the children of Don Bosco Navajeevan in Ramanthapur. Certainly this maiden trip of ours to India has given better understanding of India and types of services provided to the most needy youth of Indian Society.